Pelican on a post at sunset. He patiently posed for me for quite a long time. Quiet a handsome pelican if I do say so myself. This shot is simply charming. 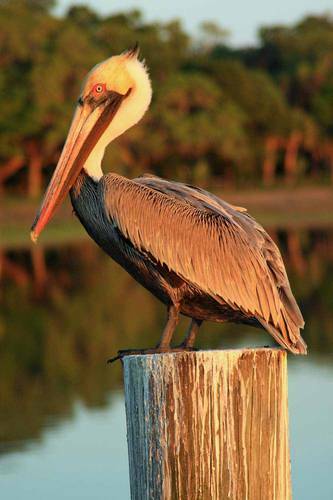 Hi Tanya, Welcome To The Lens Flare.. Great shot of the Pelican standing on what looks like it's favorite post LOL.. Hey if you need help with anything just yell over on the message board or even at our Yahoo Groups. Yea I'm one of Brian's helpers here at TLF.